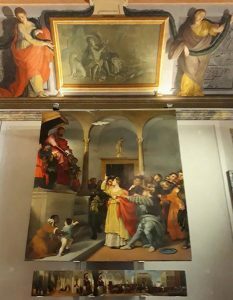 One of the most beautiful paintings by Lorenzo Lotto, “Pala di Santa Lucia” at the Pinacoteca Civica of Palazzo Pianetti in Jesi, commissioned in 1523 by the Confraternity of Saint Lucy, the richest of the city, that managed the hospital close to the church of Saint Floriano. Development of the painting took a long time, maybe for difficulties in being paid, Lotto was always in shortage of money, the painting was finished in 1532, i.e. nine years later. Few information we have about the painter and his childhood, he was born in Venice circa 1480 probably from a merchant family. You can imagine the context of that period, in the middle of the Renaissance, in a widespread cultural and perhaps unrepeatable fervor, the city becomes the “Serenissima”, enjoys the profits of its rich trades while Constantinople had lost its importance thirty years before, delivering to the city many precious Greek texts that Aldo Manuzio will reprint. Everything speaks Greek. But it is also the Venice of Bellini and Giorgione, of Titian and Sansovino. 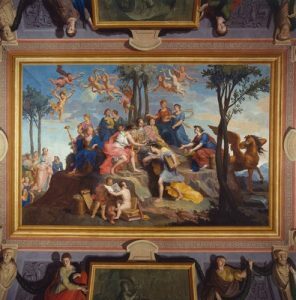 In a similar context, for a true Venetian – like Lorenzo Lotto was – perhaps the city is a little too crowded, unlike painters coming from the mountains like Titian or from the countryside like Giorgione, who remain electrified by that culturally rich climate, perhaps Lotto is fed up with Venice. And so he emigrates. He was described as saturnine and melancholic, he was not attached to money and power as Titian was, who opposed him in every way: “O Lotto, as good as goodness, and as virtuous as virtue …” Titian wrote on his behalf. You may think that Lorenzo Lotto felt superior to this kind of earthly vanity. Was he maybe an anarchist “ante litteram”? Perhaps it was his scarcity of means to bring him into curiosity and melancholy, “alone, without faithful government, and very restless about the mind”, he wrote at some point in his life. Probably, painting was the only thing that really mattered to him. A man always escaping from himself, though not as simple as Vasari describes, he was just one who disagreed cards, which is never a good road to success. When you look at the Lotto’s “Pala di Santa Lucia” you definitely notice Lucy and her finger pointing to the sky, it looks like she knows way too many things and she is also able to tell them. She is a woman that debates, Lucia/Lux enlightened by light and therefore divine, who tells Pascasio what she thinks. Pascasio is the Roman proconsul of Diocletian, certainly not a tolerant emperor. Lucy, who spoke with her mother afflicted by a disease and then healed thanks to her faith in Saint Agata, decides she will not marry, will remain virgin and will leave her possessions to the poor. And this is a true sacrilege to Roman familistic and patriarchal power. Christians of the first centuries were persecuted because their language was revolutionary: they gave way to poor, to women and to the “last”. It was only afterwards that, when Christianity became a dogma, it became patriarchal and familistic, so that Constantine accepted it as religion of the Empire. Lucy is still a threat to the constituted power, she is the one who did not get hurt by thirteen oxen to which she was bound and led to the Lupanar. She teaches us that if you believe in something, then nobody can damage your belief. Isn’t Lucy’s holiness nothing more than her determination? The divine ray that comes down to us when we do not even know where it comes from. The man who looks at us, the only one in this moving gallery of characters, seems inviting us to enter the scene, but also it seems he’s asking for our opinion, “what do you think about it?”, in his smile vaguely ironic and distant, a real celestial element of the context. Is Lorenzo himself asking? In his life Lorenzo probably asked to himself many questions, hence his reputation of being a restless man. Perhaps he did not find many people to communicate and certainly, he was looking for quietness in the region Marche, a peace of mind that the stunning landscape of the Marche was raising and still does. There he could find simplicity of human relationships, spontaneous and true faith that he could not certainly find in Rome nor Venice. He was very interested in astronomy / astrology and alchemy. He was a neoplatonic, like many artists and writers of the time, and this does not make him such a pious and devoted man as he was dreadfully “painted”. It should also be emphasized that in the Sixteenth century a real re-evaluation of the female figure was taking place, who speaks in the “Book of the Courtier” of Baldassare Castiglione and stimulates discussion and reasoning. 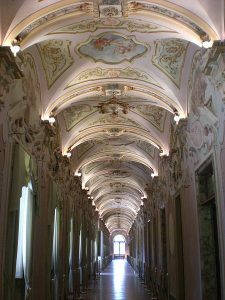 Lucy deserves a visit and contemplation, in the beautiful setting of Galleria Pianetti at Palazzo Pianetti in Jesi, which for its beauty is also called the “little Versailles”.